What NICK MALLETT had to say on SuperSport about the Super Rugby semi-finals in Christchurch and Johannesburg. 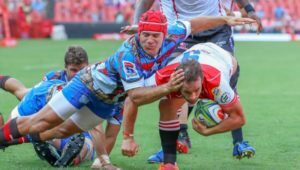 ‘The Crusaders pack and their style of play make them very difficult to beat when playing at home. They scored four good tries through some nice direct play and an international pack of forwards. ‘The scoreline was quite high. I thought the Hurricanes would be more competitive than that and it doesn’t bode well for the Lions, who will have to travel to beat the Crusaders. ‘It is a truism that the halfbacks that dominate a game generally dominate because their pack is dominant. They have more time to make good decisions and unfortunately if you give time to New Zealand backline players they invariably make the right decisions. Often taking it to the line, they have two or three passing options and of course, Richie Mo’unga has his own ability to break as a third or fourth option. ‘All of us were a little bit nervous with that fast start from the Waratahs, who showed what they can do with quick ball. The energy they showed in that first 20 minutes was a bit nerve-wracking. ‘The Lions managed to wear them down. 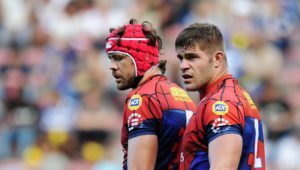 As Warren Whiteley so rightly said, they went back to their driving maul and scrum and they got some penalties, tries from driving mauls and turnovers. 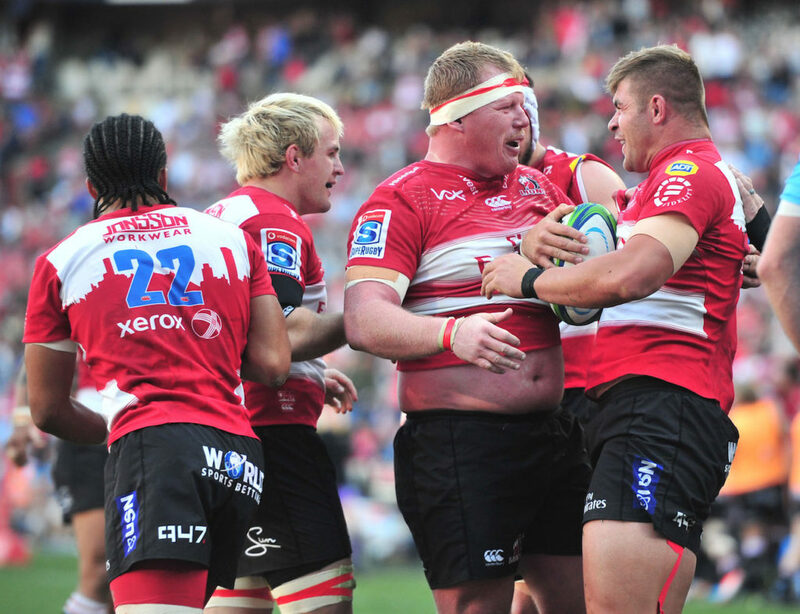 ‘Kwagga Smith played very well today and he was aided and abetted by his front row, they made big contributions. There were two great individual tries in that first half. ‘In the second half, you almost felt the Lions had too much and as the game progressed you saw the Waratahs’ energy seep out of them. The Kwagga Smith try defined it. It showed the Waratahs team as a whole were very tired at the end of the game. ‘If we look forward to next weekend, what the Waratahs have had to experience this week, the Lions are going to experience going in the other direction. It is a failing of this competition, in that there is a massive advantage to the side that plays at home if the opposition has to cross the Atlantic to play. ‘If you look at the Lions’ strengths in the last couple of weekends, they have been very good in the scrums and they have dominated with maul tries. If you look at their opposition next weekend, you have got Joe Moody, Codie Taylor, the flanks, Sam Whitelock and Scott Barrett, all of them All Blacks. So their strengths are going to be countered by the Crusaders’ strengths. ‘The forwards are an area which the Lions have always fallen back on when they face difficulty. If you are up against a team that counter your maul and you can’t dominate the scrum then it becomes more difficult for them to impose their pack and play onto the opposition. ‘The more time you give a New Zealand side … if you stay on your advantage line and you don’t break the line, you wait for them to come to you and make double hits and turnovers, it is a passive defensive system that means you don’t get linebreaks but you don’t put the opposition ball carrier under pressure. 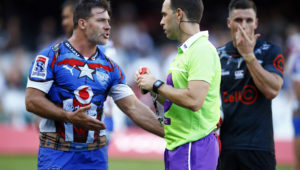 ‘So are they going to go up against the Crusaders, who have got some of the best decision-makers in the competition, and allow them time on the ball because they want a safety defence, or are they going to say let’s try and speed up our defence a little bit just to get in their face? The defensive system is going to be under pressure and the Lions strengths are going to be countered. That is what is going to make it difficult, other than the travel. ‘It is such a difficult thing for Elton [Jantjies] because he does so many brilliant things. That was a masterful cross-kick last week [against the Jaguares] and at the end of this game. But you want your 10 to make good decisions. He needs to eliminate mistakes. Far more than being a brilliant player, a 10 who makes very few mistakes is a very competent player. You don’t want someone who makes three brilliant decisions and three disastrous decisions. ‘I think if you are looking at international selections, everyone discussed Elton and if he was going to be backup or if they were going to look outside him. 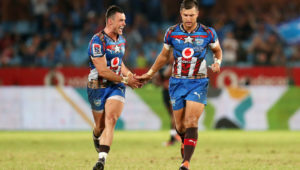 What would do Elton a tremendous amount of good is a phone call from Rassie [Erasmus] to tell him to relax and assure him of his place in the Rugby Championship squad. My feeling is Elton is playing to prove himself all the time and he just needs to be nice and composed. ‘Even though the Crusaders are direct, they are also unpredictable. They can play off nine and 10. It means your second and third defender have a problem as they don’t know who is going to get the ball. That makes it harder to make leg tackles and to steal the ball. ‘You have to have a plan. It is all very well having belief, it gives you the ability to get off the ground and make tackles. But you have got to go in with a plan as to how you are going to handle the Crusaders. They have to take them on in the forwards. You cannot allow them to dominate. The Lions have the one pack in Super Rugby that can match the Crusaders. They have a guy in Malcolm Marx who is better than any of the Crusaders forwards. The Lions’ front row can match the Crusaders’ front row.